Go means “hard”, Ju means “soft” and Ryu means “style”or to flow like a river which suggests that the study of Karate is endless. The Go aspect refers to a strike that emphasizes maximum power generation with little effort. The Ju aspect refers to the softer, sometimes yielding methods of defence that enables adhesion, sensitivity and eventual control of an attacker with the choice to harm or not to harm. There are many methods of power generation practiced in Kakurin Dojos (Training Halls) with the objective of increasing one’s power, even as one ages. This objective is only possible with rigorous, systemised training. Kata (form)and bunkai (combat function) are animated by a series of foundation principles, once internalised a plethora of techniques may be created intuitively. Kakurin Kan is authentic Karate. Kaku means “crane” and rin means “people”, and the term Kakurin refers to the strong influence of the Chinese White Crane System of Gung Fu has had on Goju-Ryu. The name was suggested to James by Master Ohtsuka at the time of his retirement. Tadahiko Ohtsuka 10th Dan (1940 – 2012). 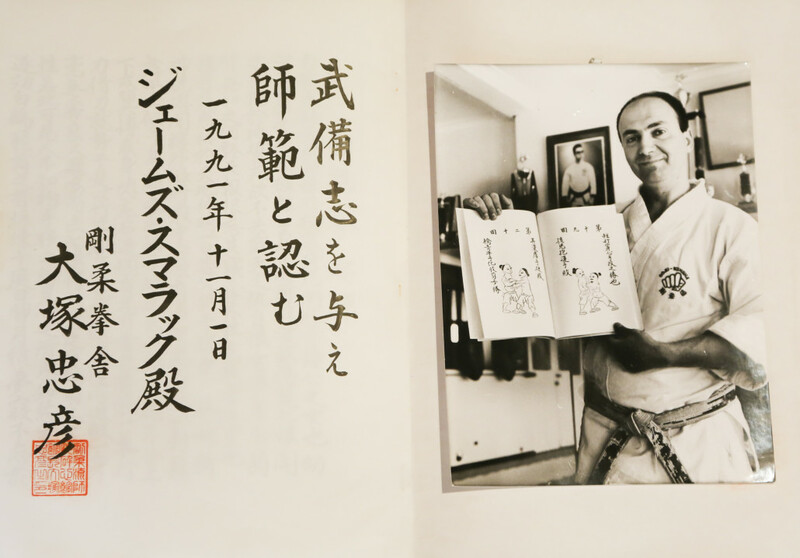 James Sumarac had been a personal disciple of Master Ohtsuka since their chance meeting in Tokyo in 1973 and all his Dan gradings have been awarded personally by him. At Tokyo in 1991 at the time of his 7th Dan Kyoshi title Master Ohtsuka also bestowed upon him a Bubishi Master Licence. The preoccupation of competition Karate is not evident in Kakurin Kan, instead a relentless search of original and authentic martial art training methods, principles and philosophies. We at Goju Ryu Kakurin Kan International are blessed to have Michiro Noguchi Hanshi as our Head Instructor and mentor. As recently as March 2016, Master Noguchi visited Australia for an intensive four day workshop and to oversee high level Dan gradings. We travel to Japan on an annual basis to further our training and development with Master Noguchi and his senior members. Karate comes from the Japanese meaning “empty hands”, referring to a martial art that does not require actual weapons (instead using the human body as tools of this art), as well as the subtle Zen sense of being ’empty’ of agressive thought. The “-do” suffix means “way”. Karate is a mature art and had its developments on the small island of Okinawa, part of the Ryukyu island chain that (both culturally and geographically) links China and Japan. Its origins lie in China. 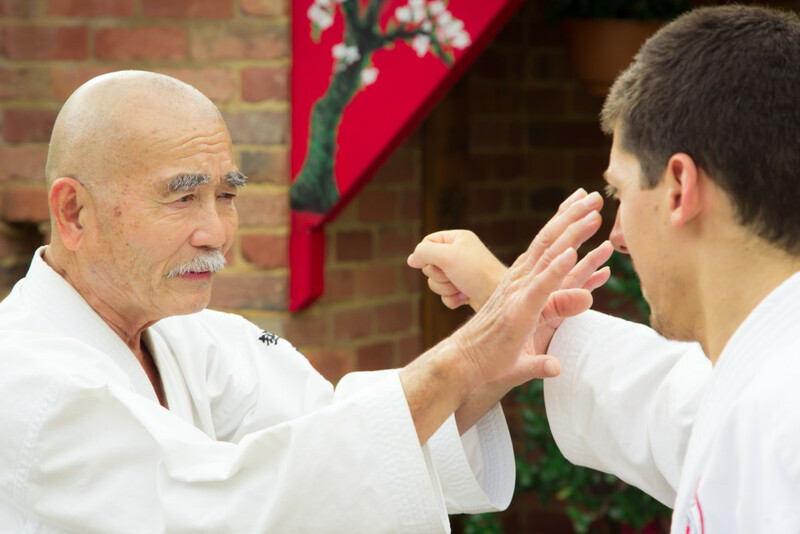 Click here to read more about the origins of Goju Ryu Karate, its masters and developments. Click here to view our training locations. Click here to view more information about our classes. Congratulations to everyone who participated in the International workshop (gashuku) with Master Noguchi Michiro, in particular the people who graded on this special occasion (see below)! We were excited to welcome Master Noguchi back for a second visit to Australia, and were rewarded with an exciting weekend of Karate. James Sumarac on right with senior heirachy of the late Ohtsuka Tadahiko, founder of Goju Kensha. 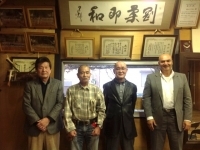 From the left Master Morita, Master Noguchi and Master Matsuura in March 2014 at a training reunion in Japan. On my many training trips to Japan, Ohtsuka Sensei has been described by many as a great man of Karate, a genius of the Martial Arts. What makes a Karateka great? Is it their lineage ? Is it their ability to perform technique with awesome power and precision? Is it their ability to transmit knowledge and experience to anyone? Is it how they are able to align their life to accomplish things that others have not been able to accomplish no matter how many daunting obstacles they face? Is it someone who not only has the physical prowess but actually lives the philosophy of the Martial Arts with integrity and life long dedication? In my opinion it is all of the above plus the ability to recognize and discriminate what is important, find the best teachers in their given field and learn all they can offer. Let’s visit the three main influences on Tadahiko Ohtsuka that facilitated the creation of his GOJU KENSHA SCHOOL. 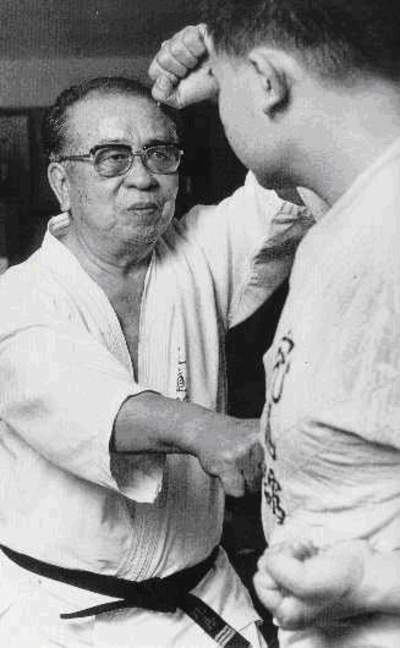 ICHIKAWA SOSUI (1924-2005) Ohtsuka Sensei was 15 years old when he was formally introduced to Master Sosui Ichikawa and it was at his humble dojo in Ueno, central Tokyo where Master Ichikawa provided him a solid foundation of Goju Ryu Karate. Within 10 years of incredible dedication he miraculously reached Godan 5th Dan. Three years later he was heading an International organization with thousands of members. 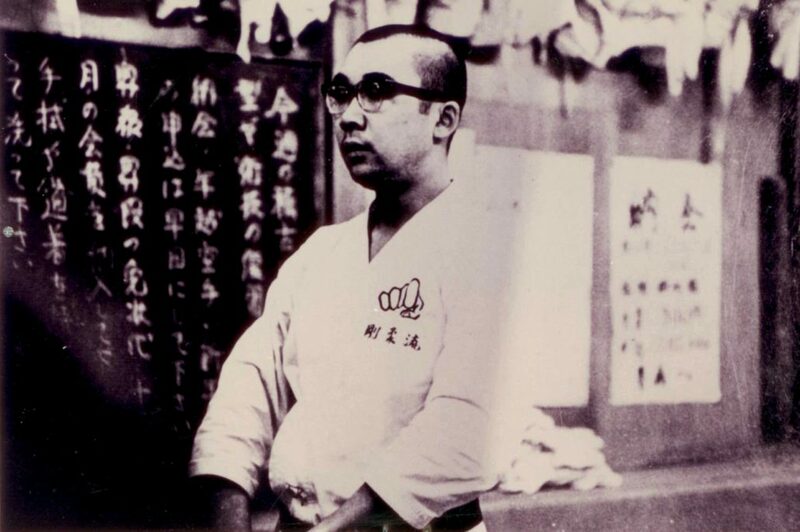 Many people may not recognize the name Sosui Ichikawa 10th Dan Goju Ryu, but within Japan and Okinawa, he was very well known by high profile Martial Artists such as Ninjitsu teacher Masaaki Hatsumi, Okinawan Goju teacher Meitoku Yagi and Shotokan legend Hirokazu Kanazawa. All had studied and consulted with him on advanced concepts of his Karate. His name is synonymous with a brand of Goju Ryu rarely seen by Japanese let alone foreigners. He lived as a recluse and rarely ventured from his home /dojo except for weddings and funerals. Master Ichikawa was eccentric in many ways but concealed a heart of gold. Not known for his friendliness, he didn’t tolerate fools well and is quoted as saying that he preferred the company of cats and dogs than humans as they were more loyal and smarter. A direct student of Kanki Izumikawa 1908-1969, he spent his entire adult life training, teaching and researching the Budo aspects of Karate. Quite a tall man by Japanese standards he stood 6 foot tall, he trained daily and was fanatical about each and every move of Traditional Kata. He emphasized that “the minutest fault be it physical, mental or spiritual meant the difference between living and dying. His Dojo was cluttered with various weapons, and he was always keen to research them. Master Ichikawa believed that they were only an extension of your mind and body. He taught his students to understand and appreciate the signature function of weapons in order to defend against them. “If you open your mind you will see all ways are the same. It’s only the way your mind sees them”. “Close your eyes and you will see, cover your ears and you will hear, close your mouth and you can speak”. After San Dan (3rd Degree Black Belt), Master Ichikawa insisted his disciples wear a black uniform dogi as he figured at that level you should be almost living in your gi and not have too much time to wash it. He believed that the practice of Karate should become an integral part of your daily life, to that end he specially made racks for his students to hang out their gi to air after training as he believed your spirit remained with your gi. As a harsh and demanding teacher, if he observed a student was distracted during training he would send them home and insist that they return only when their spirit was strong enough to train in his school. YANG MING-SHI (1924 – 2006) Meeting Professor Yang had a profound impact on a young Tadahiko Ohtsuka. Their long relationship led to a radical change in Ohtsuka Sensei’s perspective on Martial Arts in general. The Professor convinced him through his example, that the study of Tai Chi Chuan is a means of enhancing ones’ ability and effectiveness in Martial Arts into later years. 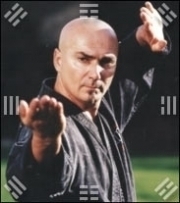 Many Karate people nowadays use Tai Chi Chuan as an adjunct to their training providing that important balance. However in the mid seventies he received much criticism in Japan from the Traditional Karate fraternity because it wasn’t Japanese! Yang Ming Shi was born in China into a famous family of Yang-style Tai Chi Chuan. He studied Tai Chi from the age of three and he went to Japan in the 1943 as an exchange student and with the advent of the Communist system in China he chose never to return. Becoming a Japanese National, he graduated from Kyoto University in 1948 and later attended Daito Bunka University in Tokyo, becoming a Professor of Literature. He also studied Karate at the Japan Karate Association (JKA) and reached the level of Master. 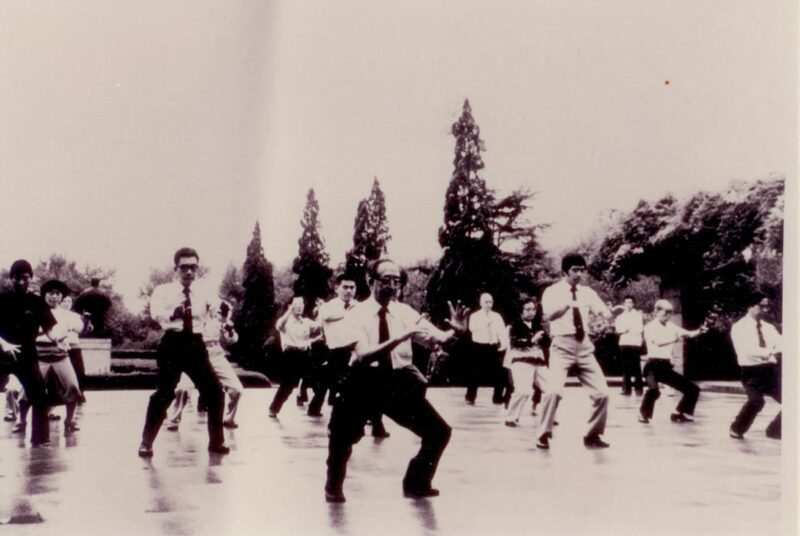 Yang Ming Shi founded the Japan Tai-Chi Chuan Association and taught thousands of Japanese his Tai Chi Chuan form. Ohtsuka Sensei sought assistance from Yang Ming Shi and with his expertise in ancient Chinese, he was able to translate the original Chinese Bubishi text to Japanese. It was this translation in fact, that caused an unfortunate rift between Ohtsuka Sensei and his Goju Ryu teacher Sosui Ichikawa that lasted to his passing. I had the immense pleasure to meet and train with Master Yang in 1981, an absolutely charming man, gentle mannered and articulate in every way. To me, he epitomized how a real Master should look and behave. YOCHOKU HIGA (1910-1994) Born at Naha City Okinawa, he was described as a weak child that was often a victim of bullying. His concerned and well connected grandfather sent him to study with Gichin Funakoshi and Chojun Miyagi, but being too young he was unfortunately ill prepared for the austerity required. He served as President of All Okinawan Karate Federation and was awarded 10th Dan in 1976 for his lifetime contribution to Karate. Master Higa loved to train outdoors and often stated his most important training was done under the moonlight in his garden, “it is here amongst nature you understand and appreciate the value and beauty of Karate”. The mottos of Kyudokan, Master Yuchoku Higa’s karate dojo, are as follows. – Avoid fighting or quarreling. – Respect your elders and nurture your young people. – Morality and good manners in a Karate dojo will have an influence on the community. 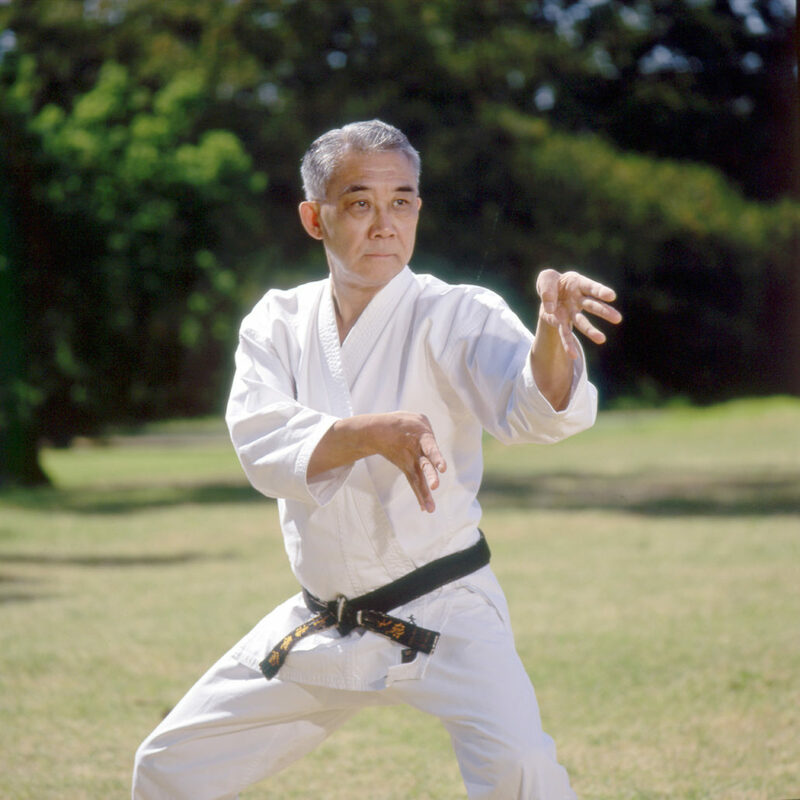 Master Higa believed traditional Karate was dangerous and in a real fight serious injury or even death is possible. Thus deeming it unsuitable for competition. Famous for his makiwara (strike post) training, he could break the pad of the makiwara by striking the corners and then centre, he was also known to break the makiwara on the rebound at will, this involved unique punching skills. “There is no end to mastering Karate. If we seek the Truth, the path towards the Truth will become distant”. There have been several other influences that do need to be acknowledged. Great Masters Feng Zhiqiang, Zhu Tian Cai and Chen Xiaowang were instrumental in fulfilling Ohtsuka Sensei’s passion for Chen Style Tai Chi Chuan. Ohtsuka Sensei also admired Wang Shu Chin, who spent five years in Tokyo sharing his expertise in Ba Gua Zhang and Hsing I Chuan out of the Chen Pan Ling School. Tadahiko Ohtsuka had a photographic memory giving him an uncanny ability to learn movements and techniques with unbelievable speed and retention. 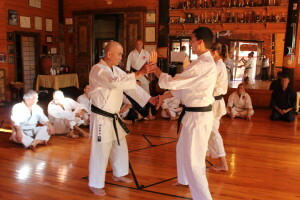 Even with a glance or in conversation he could link up congruent movements from different styles, recognize a common theme, and blend his own existing knowledge, skill and insights to present the world with Goju Kensha.